At Austin Foot Health Specialists, we hate doing KeryFlex toenail procedures but we love the results! Let me explain. Keryflex nails are a new type of artificial toenail which bonds to the existing toenail. In most cases, at least half of the toenail has rotted away because of the fungal infection. The toenail looks absolutely horrible. We can do the laser procedure to kill the fungus in the toenail and the nail will hopefully grow out much more normal looking over the next 6 to 8 months. But what happens until the nail grows out? The appearance of the terrible looking nail is not improved by laser treatment. You basically have to live with a short, deformed, ugly toenail until the healthy nail grows out. The Keryflex nail provides a good-looking nail immediately. The Keryflex nail is not the same as an acrylic nail. It shares more properties with a normal nail and is even recommended to be used after a laser procedure. Topical antifungal medicines are usually used after a laser procedure to prevent fungus reinfection. The topical antifungal medicines can penetrate the Kerynail just like a normal nail. 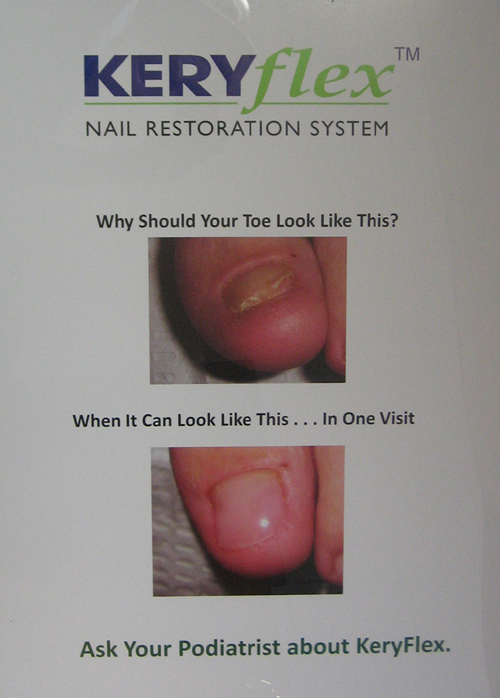 The Kerynail also provides protection for the nail bed and facilitates normal growth of the new fungus free toenail. So why do we hate doing KeryFlex toenails? The procedure is exacting and is slow, there are many steps. Usually, the KeryFlex nail will adhere well to the nail base – but sometimes it does not. Usually, the Keryflex nail lasts for about four weeks, often much longer. However, the Keryflex nail is more brittle than a normal nail and occasionally comes off in a few days. We wish the procedure was quicker, simpler, and could be guaranteed to last a long time. The Keryflex nail does offer a great addition to the laser fungus toenail procedure. We are proud to be the only office we know of in the area to be combining these two procedures to give a fungus free and excellent looking toenail in one visit! Please call us at the Austin Foot Health Specialists if we can help you. Previous Post Previous post: Isn’t it cheaper if I just buy it online?